Only your ship gets to have fun. 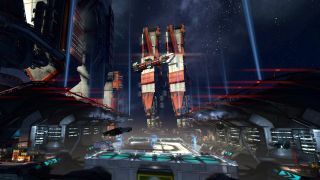 X4: Foundations introduced the series’ first ever online mode just before the holidays, which isn’t quite as big a change to the normally single-player space sim as you might think. Online ventures let players send their ships and crews into the universes of other players, but it’s not possible to join them. It might be an online mode, but it’s not a multiplayer mode. The system, while available in the live game, is still in beta, so ventures may go awry in unexpected ways. Every player now has a venture platform and venture dock that can be constructed on any station or the HQ. From there missions can be selected and ships sent out on jobs. Check out the video walkthrough below. Online ventures are optional, but it doesn’t sound like it will really have much of an impact on your game. You might spot some ships that have been designed by other players flitting through the galaxy, but they'll be controlled by the AI. Right now, there’s no risk to your ships, but Egosoft plans to eventually add aggressive missions and appropriate consequences. I used to spend an unhealthy amount of time playing the X series, particularly 3 and its standalone expansions, but the massive disappointment of Rebirth really knocked me out of the series’ orbit. Judging by X4’s reception, I’m not sure that’s going to change soon. And that's a shame. Elite keeps me busy, but X is a very different kind of stellar sandbox. I can't become a proper business tycoon in Elite or command a fleet—my ambitions have to be a little bit smaller. It might be time to crack open X3: Terran Conflict again.